For some reason, despite her books clearly being right up my alley, so to speak, I'd never read anything by Austrian-born British children's author Eva Ibbotson. Fortunately, then, my friend Caroline kindly stepped in and sent me a copy of The Star of Kazan, one of her own favourites, as a birthday gift a couple of weeks ago. As you might have seen if you've read my previous two blog entries, I've read some rather depressing stuff lately. Bleak. Gritty. Dark. Which is all very well, but sometimes you just want to read a lovely cosy children's adventure, and The Star of Kazan was certainly that. The book tells the story of Annika, a little girl found in a church as a baby and brought up by two servant women in the house of three eccentric Viennese professors. Happy enough though Annika is - she's expected to be a dab hand at apple strudel, but she also has plenty of time for playing with her friends and enjoying birthday treats - she still wonders who her real mother might be, and whether she'll ever come back for her. When a rich lady turns up, claiming Annika as her own, however, things don't quite pan out as Annika hopes, and the story becomes a captivating adventure of mystery, resourcefulness and friendship. 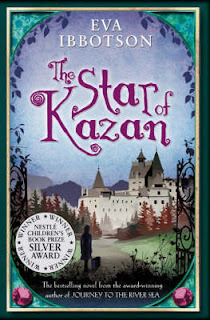 With a heartwarming charm and sense of adventure and intrigue reminiscent of many of the best classic children's adventures from A Little Princess to The Wolves of Willoughby Chase to the stories of Diana Wynne Jones, The Star of Kazan is atmospheric, frequently funny and full of immensely memorable characters, including some immensely horrid villains. Annika is a likeable and completely believable heroine, too. Plus, the affection with which Ibbotson describes the city of Vienna means that the city almost becomes a character in its own right, and I defy anyone to read this book without immediately wanting to hop on to the next EasyJet flight there to eat coffee and cake, ride the Ferris wheel at the Prater and watch the world-famous Lipizzaner stallions at the Spanish Riding School. It's all tremendous fun, and a brilliantly cosy, comforting yet unputdownable read which has cheered me up a great deal while I've been miserably laid up with flu. I totally agree with your review of this book! My daughter and I read it together and fell in love with it, my daughter so much so that she wanted to get a guidebook to Vienna and is desperate to visit the Prater and the Lipizaners. We're looking forward to reading more Eva Ibbotson in the future.